Hey teachers! I just finished recording a new character education song called, "Hey Bully!" This song teaches kids how to deal with bullies. Share this song with all your teacher friends and use it in your classroom for discussions about anti-bullying strategies and techniques. 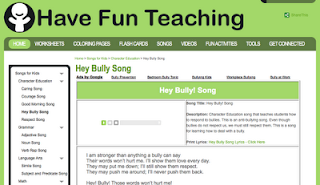 Feel free to use this anti bullying song in your lesson plans!